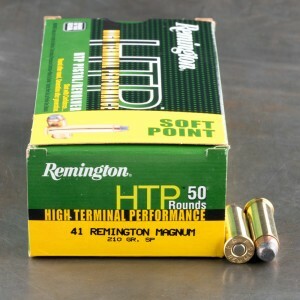 41 magnum soft point ammunition falls into the same class of ammo as jacketed hollow points. The round is designed to expand and deform on contact causing the utmost damage possible. Since the 41 Magnum is designed as an excellent man stopper, expanding ammunition is a must for modern self-defense. Soft point ammunition is an excellent alternative for people who live in states that restrict ammunition types. Soft point ammunition is also a capable hunting round and more often approved for hunting in most states. 41 mag soft point ammo is available by a wide variety of manufacturers and available in a variety of different loads that vary in weight and power. Very clean and accurate. Was hitting 18 X 18 inch steel plate at 100 yards 4 out of six times with a 4in Smith & Wesson model 57. Going to purchase more.